Carl Bridge is a multimedia artist and educator living in Western Massachusetts. 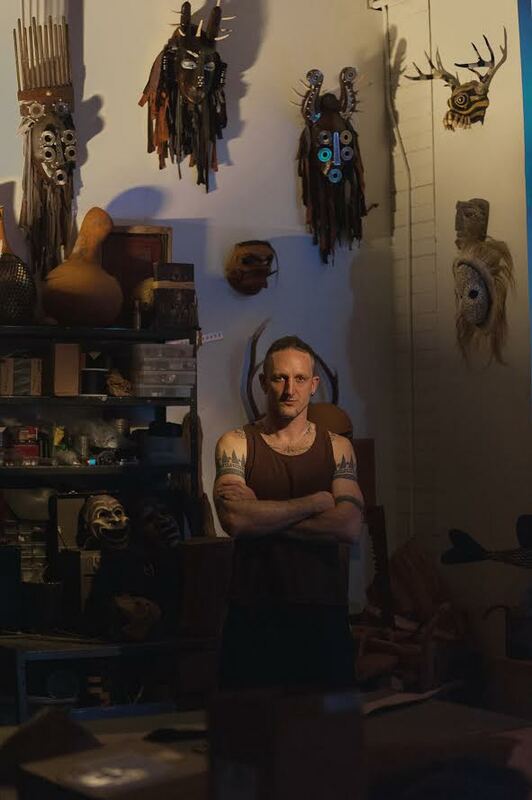 His explorations span from sculpture, painting, mask making, and costuming to creating musical instruments and live performances. His foundation in visual art was shaped through childhood by his father, George Leighton Bridge III, who was the head of the art department at Noble and Greenough School. With this early exposure to a variety of processes and materials, Carl was drawn towards theater and stagecraft because it brought many disciplines together into an immersive experience where art can come to life. After studying Scenic Design at Boston University, Carl worked in the entertainment industry creating props, puppets, creatures and characters; he also performed as a puppeteer. This experience has brought a wide range of skills into his teaching and personal artwork. I strive to create moving experiences that connect us to each other, as well as a sense of mystery as a percussionist, performer, visual artist, and art teacher. Frequent family trips to museums and galleries oriented a very young me towards the power of art, but it wasn’t until High School that I experienced the potential within Theater when my brother and I had the opportunity to create (and operate) an Audrey II puppet for our school’s production of Little Shop of Horrors. The challenge of building a life-size puppet was only the first level of artistry. The second, and more satisfying, was bringing this sculpture to life through performance. Transforming a pile of foam, fabric and paint into a live, menacing alien bent on eating a humble florist and his girlfriend was an especially gratifying experience. I had the art bug. Building on that early exposure to theater’s potential, and the strong emphasis on creative pursuits in my family, I continued to participate in my High School’s theater program, and then went on to study Scene Design at Boston University. Later the FX work I did in Los Angeles for Anatomorphex, Crisis FX and Masters FX would be informed by my undergraduate experimentations creating setting/time/place/mood through scenic designs and costumes which resulted in a high-energy and emotional takeaway for audiences. Working alongside so many talented craftspeople in LA helped arm me with a highly diverse skill set. I found that there were many props builders, puppeteers and other craftspeople who were highly proficient in one, single skillset, and others (like myself) who thrived by being able to problem solve and adapt to new challenges. Now, as a teacher, I hope to cultivate that competence within my students. In part to demonstrate that with patience and effort one can achieve strong results with simple matter, and also to avoid the hazardous and cost prohibitive products that are commonly used in the FX industry, my personal artwork has recently shifted to using materials that I focus on with my students. Most of my current sculpture and mask work relies primarily on recycled materials: paper mache, paper-clay, and found objects as a foundation for figurative sculptures. Some of these utilize scraps of wood or small scale studies left in the studio of my Great Uncle, Master-Sculptor Clark Battle Fitz-Gerald. But it is not only the intention to impart diverse skill sets to my students that drives me. In my work I also endeavor to open the door to mystery and feelings that words rarely capture. Within my sculptures and paintings, I find myself drawn to abstract symbols and archetypes in the hopes that I will leave room for this personal interpretation and individual connection to my work. Joseph Campbell wrote,“This is an important point about symbols: they do not refer to historical events; they refer through historical events to spiritual or psychological principles and powers that are of yesterday, today and tomorrow, and that are everywhere.” This out of time quality invoked by symbols is also inherent in my mask-work, perhaps in part because the performer is obscured. A viewer is often more focused on the entity or character embodied by the mask and physicality of the performer, rather than the knowledge or assumptions one might project onto the human wearer. Harkening back to my earliest experiences with performance (combining the preparatory design and construction ahead of opening night with the live experience on the stage), I seek to use my skills to offer immersive experiences that will bring audiences not just challenge and unsettling insight, but also delight and comfort.